Lacking a place to call their own, and bored of drinking in rundown bars in the capital, a small group of journalists came up with the idea of establishing their own club for expatriate reporters and photographers in Phnom Penh. 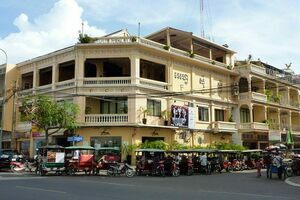 So was born the Foreign Correspondents Club, located in a three-story colonial-style building with exceptional views over the Tonle Sap River. Over the following years, the FCC played a vital role for journalists in Cambodia. Not only as a bar and restaurant, it also became a leading cultural and intellectual center in Phnom Penh. It held panel discussions on human rights, press conferences, photo exhibitions, and featured a range of guest speakers and panelists from various walks of life, including politicians, authors, dancers, journalists, royal biographers, and Buddhist monks. Today, the FCC remains an iconic landmark in Phnom Penh, although the link between the club and the foreign correspondents it was created for has diminished. It's still just as popular, but you're more likely to find regular locals, expats, and tourists sipping gin and tonic at the bar rather than war photographers from Reuters. That said, the FCC does retain much of its old atmosphere, and the sense of history and adventure is palpable as you sit beneath the ceiling fans, looking out across the river. You never know when a journalist or a high-level diplomat might pop in. In 2016, U.S. Secretary of State John Kerry visited the FCC before a series of meetings with Cambodian leaders.